SpyFu is a cloud-hosted system that is focused on search marketing. It provides online marketers the search marketing secret formula needed for them to succeed in their online marketing campaigns, and it does so on a reasonable price. 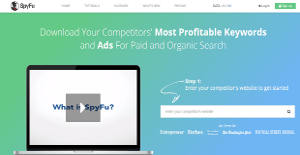 SpyFu provides valuable information on the most profitable keywords and ads for paid and organic search that are being utilized by competing marketers, giving users the competitive intelligence that fuels smarter strategies. SEO and PPC professionals benefit greatly from the cutting edge technology being offered by this platform, and the fact that it guarantees them a more successful online marketing strategy that would boost revenue, and win more customers in the process. SpyFu allows you to search for any domain and see every place these domains shown up on Google: every keyword they’ve bought on Adwords, every organic rank, and every ad variation in the last 9 years. This provides users the opportunity to learn how to connect with these domains as well by finding online and traditional leads methods, such as social media, email, phone, and address, that cannot be found anywhere else. SpyFu offers smart recommendations that drive clicks to the business’ SEO or Adwords campaigns for more effective marketing. Any bad keywords detected are eliminated so users get the best keyword choices available. Tools are also available that enable them to monitor paid and SEO rankings on search engines such as Google, Bing, and Yahoo. The best part is that no testing is needed for keyword research. Users can leverage their competitors’ lessons by drawing on historic hits and misses. Reliable contact info is also available to help businesses build partnerships or generate sales leads. SpyFu’s technology help transform Adwords data and Google search results into insightful answers that expose new opportunities for search marketers to help craft better online marketing strategies that delivers the needed results for the business. Every company is different, and can require a special Marketing Software solution that will be fit for their business size, type of clients and staff and even specific industry they support. You should not count on finding a perfect software that will be suitable for each company no matter what their background is. It may be a good idea to read a few SpyFu reviews first and even then you should remember what the software is intended to do for your business and your staff. Do you need an easy and intuitive app with just elementary functions? Will you really make use of the complex tools required by pros and large enterprises? Are there any particular features that are especially practical for the industry you work in? If you ask yourself these questions it is going to be much easier to locate a solid software that will fit your budget. How Much Does SpyFu Cost? We realize that when you make a decision to buy SEO Software it’s important not only to see how experts evaluate it in their reviews, but also to find out if the real people and companies that buy it are actually satisfied with the product. That’s why we’ve created our behavior-based Customer Satisfaction Algorithm™ that gathers customer reviews, comments and SpyFu reviews across a wide range of social media sites. The data is then presented in an easy to digest form showing how many people had positive and negative experience with SpyFu. With that information at hand you should be equipped to make an informed buying decision that you won’t regret. What are SpyFu pricing details? What integrations are available for SpyFu? If you need more information about SpyFu or you simply have a question let us know what you need and we’ll forward your request directly to the vendor.